Slow cookers or the old fashioned term, crockpots are seeing a resurgence in modern cooking. This recipe is really easy (fool-safe), will boost your immune system and ward away winter chills and infections. The best part is you come home from a busy day to the house filled with the delicious aromas of tonight's dinner already cooked for you! 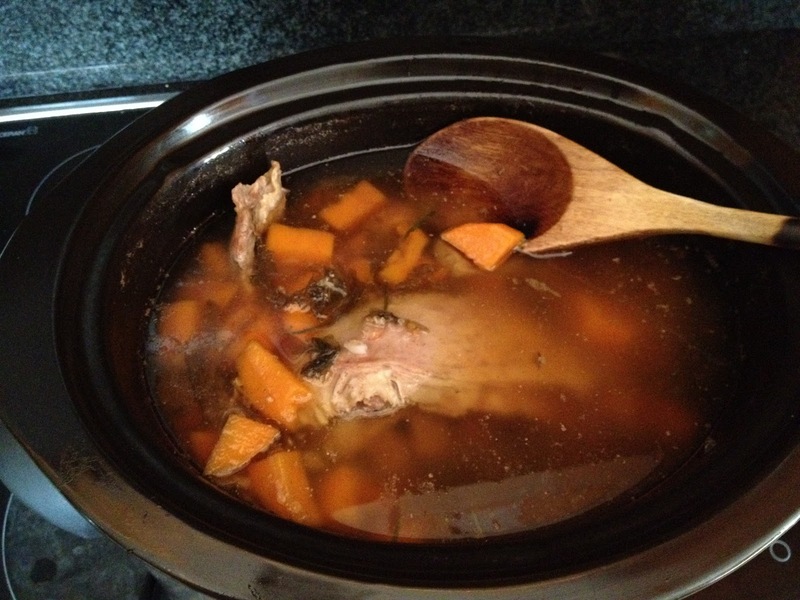 Nutrients are destroyed when food is cooked too fast or at high temperatures so using a slow cooker makes the food easier to digest, highly nutritious and quick to prepare when you have little time. I make this at least once a month for chilly nights. It tastes amazing with the chicken literally falling off the bone and makes enough to feed the whole family or keep in the fridge as leftovers for the next few days/nights as I do. 1 whole organic chicken - not just free range as they are still fed grains that are sprayed and genetically modified soy to fatten them up, ask your local butcher, markets or Coles/Woolworths sell them now at reasonable prices. Using a whole chicken means you have the bones and ligaments as well as the chicken meat which provide numerous minerals and nutrients - always preferrable! 1/3 cup of quinoa - South American seed that is now grown in Australia, is gluten free, high in protein like lysine as well as calcium, phosphorus, and iron. Choose whichever colour appeals to you - white, red (higher iron content), black and rinse with water before use. 1 brown onion - onions are perfect antidote for any coughs and colds - you'll realise how potent they are when you chop it up! Miso paste - stir in 1 Tb to crockpot if serving all for dinner or 1 tsp to individual plates if going to keep some and reheat at a later date as it is destroyed by cooking. Adds flavour, salt and minerals. Easily digested as traditionally fermented. Use whichever type you like but the lighter the colour, the cooler the effect so dark brown barley miso is generally for very cold climates. If you skip the miso, the add sea salt and pepper! Rinse barley and quinoa with water quickly by swirling in pot and throwing excess water out. Place in crockpot and chop Kombu seaweed into 2cm strips with scissors into pot. Rinse chicken and place whole into pot. Throw in thyme, chopped pumpkin into 3-4cm chunks, diced onion, apple cider vinegar and add enough filtered water to cover chicken. Cook on low heat with lid on for at least 8 hours but sometimes I leave it for 12 hours and it has been fine so long as there is enough water, it never dries out. 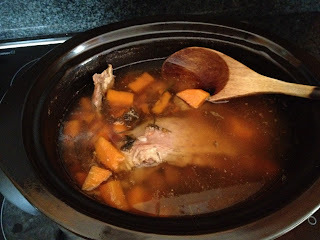 The beauty of slow cookers or crockpots is their ease to use without slaving over a hot oven or when you are time poor with all the nutrition still kept in tact and easily digestible. Most come with a small recipe book so you can experiment with tagines, breakfast porridge, soups, stews, desserts and curries. They sell them at Kmart, Target, David Jones and all major department stores from $60. Winter bargain!